An unbeaten century from Luke Wells put Sussex in a strong position after two days of their Specsavers County Championship match against Gloucestershire at Hove. The left-hander went to his fourth hundred of the season two balls before stumps when he pulled Hamish Marshall for four, closing on 102 as Sussex 326 for 4 in reply to Gloucestershire’s 367. He was ably supported by Chris Nash and skipper Luke Wright, who both made half-centuries, but Wells dominated on a flat pitch against an attack hampered by the absence of new-ball bowler Liam Norwell. The 25-year-old needed a hospital check-up after he was hit on the helmet trying to evade a short ball from Chris Jordan earlier in the day. 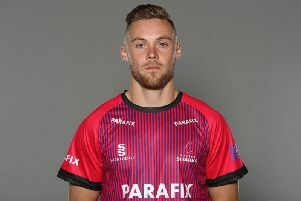 Matt Taylor and Craig Miles picked up the slack in his absence and when Taylor removed Nash for 66 and Championship debutant Christian Davis for a six-ball duck in successive overs Gloucestershire had hope. But the two Lukes – Wells and Wright – wrested back the initiative in a stand of 116 in 31 overs during which Wright played some handsome drives through the off side and Wells picked the gaps fluently, particularly against off-spinner Jack Taylor, who had a long bowl but found precious little help from a pitch which offered the bowlers little assistance once the ball had gone soft. Nash and Ed Joyce had started the Sussex innings in confident fashion, putting on 59 untroubled runs in 13 overs before Joyce played all round a fullish-length delivery from Miles and was bowled for 25. Wells, who passed 5,000 first-class runs when he reached 30, and Nash added 79 but Nash was hit on the right hand by Matt Taylor shortly after passing 50 for the sixth time this season. He pulled the left-armer’s next ball to the boundary but in Taylor’s next over he tempted Nash (66) into a loose drive to slip. Davis, out for a duck in his only previous first-team appearance, lasted six balls before Taylor had him held of a mis-controlled pull at leg gully but Wright and Wells held firm and then began to punish a tiring attack after tea. Wright (56) carelessly slapped a delivery from Miles to cover shortly after reaching only his second fifty of the season but all-rounder David Wiese played attractively for his unbeaten 38 in an unbroken stand of 70 in 18 overs for the fifth wicket with Wells, who has so far hit 15 fours from 225 balls faced. Wells said: “I was chuffed to get to three figures just before the close and be back in the morning. “I think how we fare against the second new ball tomorrow morning could be the deciding factor in this match. We bat long and would back ourselves to get a big score and a good lead then hopefully we can put them under pressure in the second innings. “We need to win really. We’ve drawn in every conceivable way possible this season but we now feel we have an attack that can take 20 wickets and other bowlers waiting in the wings. Earlier, Gloucestershire skipper Michael Klinger had finished unbeaten on 129 after his side added 35 runs in 50 minutes to their overnight 332 for 7. Klinger took a single off the first ball of the day to bring up the 100 stand for the eighth wicket with Miles but with the next ball Steve Magoffin knocked back Miles’ off stump for 56 to complete his first five-wicket haul of the season. Norwell tried to continue after receiving lengthy treatment when he was struck on the helmet but eventually went off and Wiese bowled Matt Taylor (4) in his first over of the day to finish off the innings.